Acquisition History: This property was accepted by the New Hampshire Fish and Game Department in 2011 as mitigation for wildlife impacts resulting from the construction of a wind park, with turbines spread over several ridges in Coos County, by Granite Reliable Power. Description: The boundary of the NH Fish and Game ownership begins at the 2700 foot elevation mark and ends at approximately 1000 feet from turbines owned by Granite State Reliable. High-elevation spruce-fir forests can be found between 2,500 and 3,500 ft in elevation on upper mountain slopes and ridge tops. 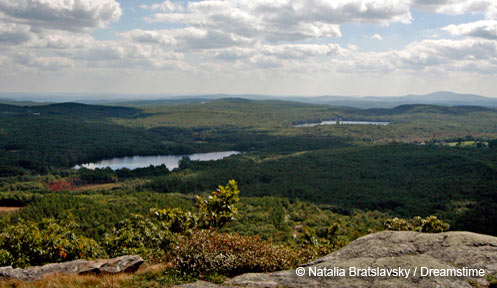 Harsh climatic extremes and highly erosive soils play a significant role in determining the species found in this habitat type, which typically includes red spruce, balsam fir, and heartleaf, paper, and yellow birches. High-elevation spruce-fir forest has a very limited distribution in New Hampshire, covering approximately 4% of the state's land area, and provides important habitat for many wildlife of conservation concern. Common Wildlife: The high elevation spruce-fir forests that dominate Mount Kelsey support less common species such as the American marten, Bicknell’s thrush, three-toed woodpecker, and the Canada Lynx. Common species may include moose, black bear, and red squirrel. Directions: The Mt. Kelsey WMA is one of the most challenging WMAs to access. Wheeled vehicular access is prohibited due to safety concerns around the wind energy generating facility located on the mountain. However the public can reach this WMA by foot from the Phillips Brook logging road via the Paris Road in Stark or the Dummer Ponds road in the town of Dummer. Be aware that these roads are only traveled by snowmobile during the winter months and generally are not passable by vehicle until after mud season in the spring.